This is a blog by Caitlin Simmonds | Storyteller, FJV, Youth Ministry Coordinator. Perhaps the best and worst part of my job is helping young people understand their worth. Once a month, I host a middle school night for the 6th, 7th, and 8th graders of St. Timothy parish. It’s an hour and a half of dinner, games, prayer, and Jesus. This past Saturday night, they turned classmates into reindeer and snowmen because few things are funnier than a person with pantyhose pulled over her face or someone with twigs taped to his arms and a carrot sticking out of his mouth. Don’t worry, no one was left out of our reindeer games. I was surprised by their willingness to admit their shortcomings. They were a talkative group of girls and proceeded to build on a metaphor of God as a trophy, trying to adequately describe our relationship to Him. I almost fell out of my seat. If you’re not appalled by how this metaphor falls short, read it again and then feel the devil twist the handle of the knife in your gut. And then hear it from the mouths of 11- and 12-year-old girls who already struggle with body image, family problems, bullies, and the demons in their own heads tearing them down. They told me they could never be good enough for God. As if they had to earn God’s love. Short on time, I interrupted as they continued to feed off one another and search for a way to complete their horrifying metaphor. We don’t have to be good enough for God. There is no good enough and there is no earning God’s love. Song of Songs 4:7 says “You are all beautiful my beloved, there is no blemish in you!” God made no mistake in creating you and He loves you perfectly as you are. We return that love by striving to be like Him. And that’s about as far as I could get. But here’s how I’ll continue the conversation: your worth, your value lies in your identity as a child of God. You are not a mistake. You are not inherently bad. You don’t have to be good enough! Psalm 139 says God knit you together with great care and intention. Ephesians 2:10 says you are a masterpiece. Check this out: at first glance, it’s a cheesy photo of Liam Neeson staring at his baby. Look closer, see the soft upturn of his mouth and the crinkles around his eye that manifest true joy. His gaze is one of complete and utter unconditional love for this tiny, perfect child. He holds his precious child in the palm of his hand, close to his heart. Imagine how you might live if you knew with deep and abiding conviction that this is how God sees you (and loves you): perfect, beloved, strong, full of the potential to do great and wonderful things. Would you allow yourself to be vulnerable and broken open so that you might love in greater capacities? Would you love others with reckless abandon so that they may come to know their value? Would you trust God to provide for you and guide your path? It’s a difficult and daily struggle because there is a war for your heart. God says you are perfect, the devil takes cheap shots at your deepest insecurities. Don’t trip over the lies that you are not good enough. Ask God to show you how much He loves you, because He will. Bold prayers honor God and God honors bold prayers. How do you remain convicted of your great value? You Graduated High School, Now What? Frankly, I don’t remember the innumerable commencement speeches I’ve heard over the years (with the exception of David Foster Wallace’s “This is Water” or Mary Schmich’s “Wear Sunscreen”). What I’m trying to say is don’t feel bad if you’ve already forgotten the one you heard just days ago. It isn’t easy being 18 and blissfully ignorant, or 18 and master of the universe, whichever you prefer. I’m also trying to say that I know this post might fall on deaf ears. You probably think you know everything, I did too when I was 18 years old. Congratulations graduates, you completed high school. Now onto the next phase of your life! Before you go charging headfirst into the summer before your first year of college, let me offer some humble advice. Disclaimer: I do not claim to be a wise sage full of clever Confucian golden nuggets of truth. In fact, I am far from such and I only claim to be a confused 24-year-old offering to join you on your journey for as long or as short as you like. Do not for one second believe that high school was the best four years of your life. Do not for another second believe that college will be the best four (or five or six) years of your life. Here comes the corny metaphor: life is a highway. You don’t know how long or how short yours will be, but you must know that you are where you ought to be and you must do the best with what you have. With that, I present to you a golden nugget of truth: life is short, eat dessert first. I’m repeating myself here, as I’ve done for years, but this is not just an excuse to skip the brussels sprouts for ice cream, it’s a challenge to live. Life will never be the same. It might get easier or it might get more difficult, but that’s not the point. The point is to love the journey, embrace the people you meet, and be the person God is calling you to be. What’s the endgame? It’s certainly not graduating and immediately starting on a career path that will eventually make you six figures. The endgame is your vocation: that thing that lights you up from the inside-out for all to see. It’s your passion, it’s your will to leave your comfort zone in the dust and pursue greatness. So friends, I’m telling you, eat dessert first: live well and love without fear that the people you meet in passing might change your life. It’s frightening, but not for reasons you might think; we are afraid of change, not of strangers. We are afraid the person we meet will force us to question what we already know to be true. Welcome the opportunity to question your truths. Allow yourself to be tossed around and learn new perspectives. While there are no guarantees, I have a secret for you. It’s a generally well-kept secret, though it should be a universally understood truth. I’m counting on you, young graduate, to spread the word. I’m building up the suspense, do you feel it yet? Whether you feel like you’re riding on a golden chariot or you’re mucking through the trenches of tragedy, real or imagined, God is always faithful. I know this secret because I have witnessed it. I have witnessed God’s faithfulness in the midst of real and imagined tragedy. I look back through my life and see His hand in it all. There are so many moments, moments where at the time, I felt abandoned, but in retrospect, I knew there was only one way I survived. God journeyed with me. In this moment, I struggle to see the immediate truth in that nugget. Fortunately, I feel in the depths of my heart the truth of the nugget and while my mind and eyes take some convincing, my heart will surely succeed. The world is full of heartbreak and joy, tragedy and bliss, injustices and triumphs. You will feel more than you have ever felt. You have newfound freedom, so explore it responsibly. Wear sunscreen. Be mindful of the interactions you have every day with people who might not seem important but are. Above all, love with reckless abandon because life is short and you should eat dessert first. “I have three part-time jobs,” I say. Cue jaws hitting the floor and occasional nervous laughter. The follow-up questions include asking what those three jobs are, why I don’t have a full-time job, what I actually want to do, and how my search is going. A: I work for the Diocese of Columbus, sub for a daycare center, and work on projects for Run The Race; full-time jobs are difficult to come by; I’m still discerning what I actually want to do; and my job search is, well, going. My fellow recent grads know the feeling. We are a generation of youth that is incredibly confident yet has no clue. We are juggernauts, plowing forward in search of the perfect career, blind to the idea that we should settle for anything less than what we think we want. Suddenly, we hit an immovable obstacle and face the reality that perfect careers don’t fall out of the sky, no matter how hard we search. But we don’t let that stop us, our response is to stay the course. As we go, we pick up part-time jobs, we freelance, and we take temporary positions. We want to do what we want to do and this is how we will do it. Kelsey Manning in an article for Levo League asks this question, and concludes that yes, this is the new normal for Millennials. Manning and I are products of the same system. We are Millennials, we want to be paid for what we love to do, and we don’t want to compromise. This is why we both have multiple jobs. Ultimately, my goal is to network and make the connections necessary to find that full-time job calling my name. Lucky for us, this is an exercise in solidarity. Each generation is expected to be financially better off than its parent generation. Generation Y is the first to fall short of this expectation. Perhaps this explains why Manning and I have multiple jobs. This is also why low-income workers have multiple jobs. We apparently live in an improved and sturdier economy, yet the poorest among us are not reaping the benefits of this economy. Middle and upper class Millennials working multiple jobs have an extraordinary opportunity to sneak a peak into the lives of the growing population living in poverty. Let me define poverty for you: poverty is a state in which an individual or family must decide between and among his/her/their most basic needs. If you can’t afford safe and reliable housing, nutritional food, health insurance or medical costs, adequate and reliable transportation, and childcare, then you live in poverty because you have to prioritize your most basic needs. Many of us Millennials are fortunate enough to have our most basic needs taken care of, but many of us also find ourselves working more than 40 hours a week, as those who live in poverty must also do. So, as I said, consider this an exercise in solidarity. As you approach hour 52 on Thursday morning of your work week, remember the men and women surpassing hour 74 in the same moment. Think of those parents skipping a meal so their children can have enough to eat. Think of the children who can’t escape their grumbling stomachs long enough to focus on their educations. Think of the families who can’t fall asleep at night because they’re terrified of getting evicted. Think of the 16-years-and-older youth who must work to keep their families afloat. Think of the homeless men and women who can’t hold down a “normal” routine or keep a job because they don’t remember what it’s like. Think of all the people who pray for a break like the one for which you’re working. In conclusion, count your blessings, but don’t stop there. Generation Y teeters precariously on the edge of success and failure, but we work hard and desire to help others. This social conscience keeps us honest. A blog is never complete without a call to action. Find a way to get involved in your local community to help those with whom you are living in solidarity. There are many aspects of this job to which I’ve grown accustomed. I’m no longer fazed by a strange conversation or request (a homeless man once asked for my phone number). I can wrangle a dozen or more nine-year-olds without a problem. I can turn away people who knock on the doors after we closed without unbearable lingering guilt. One thing that will always jar me is hearing the stories of people who are homeless. Yesterday I heard the story of a man who spent the majority of his life in prison, and was only released eight months ago. He lives on the street. Another lost her apartment in a fire, had no where to live, and worked an unsteady job as a hospice caretaker. One earned more money pan handling than working a minimum-wage job. He was caught in the cycle of addiction and homelessness, yet maintained his marriage. Still another lost her job, was too proud to ask for help, and lived in her car. One was an addict, sold drugs, was stabbed and raped, and lived in the Jungle (one of the largest homeless encampments in the country). They are (or were) homeless. They are working to better their lives. They are my friends. I greet most of these people with a hug. They tell me how they are doing and ask how I am. We smile and we laugh. We have normal conversations. The only difference between them and the rest of the people I call friends, is that they have experienced homelessness. They have been stereotyped as lazy, dangerous, incompetent, crazy, and manipulative. These adjectives do not describe any of the people who are homeless I have met. These people are my people, my community. What are we so afraid of? If we sat down and talked to our fellow humans, we would learn so much. When the people who’s stories I described earlier had nothing, they found an organization that told them they did have something: dignity. The men and women and children you pass on the street asking for change have dignity. The “crazy” person waving and yelling at others about who-knows-what has dignity. The person who’s been in and out of prison his or her whole life has dignity. The person with a mental illness who can’t hold down a “normal” routine has dignity. The person sitting next to you who smells like urine has dignity. The person walking around in endless circles on the sidewalk has dignity. Even if you can’t do anything for them, look them in the eyes and say hello. You are their brother. They have names and they have stories, just like you and me. These words come from the mouth of one of the formerly homeless group I have grown to know and love. He lived on the streets of San Francisco and then in a tent in Sunnyvale. “Look us in the eyes,” he said. Homelessness is a full-time job. You don’t get a lunch or 15-minute breaks. You don’t “go home” at the end of the day. There is no rest for the homeless. There is only one community to which we all belong. The war on poverty is not just a matter of welfare and support. The war on poverty is also a war on stereotypes. Where do you stand? On Tuesday night, not only did I cook a stellar meal for dinner, I also planned spirituality night. I’ll be honest: going into both the meal and the spirituality night, I was not sure how they would turn out. I had a semblance of a plan for both; but, as per usual, I was flying by the seat of my pants and praying to God it would turn out well. Dinner was delicious. I make some darn good burritos, if I do say so myself. I cooked chicken with taco seasoning and ranch dressing, and pulled from a recipe but made most of it up as I went along. My mouth is watering as I write this. But, living with two guys, the leftovers disappeared in a day. I was taken aback. I had just started work and quite honestly had no idea how to answer that question. Why do I do what I do? I considered it for a long time. It threw me into a bit of an existential crisis; my roommates will vouch. Finally, I arrived at an answer, but I’ll get to that in a second. Fast forward from then to about a week ago when I realized it would be my turn to plan spirituality night again. As a community, we previously decided we wanted to devote a night to social justice, so I went with that theme after consulting with one of my roommates. 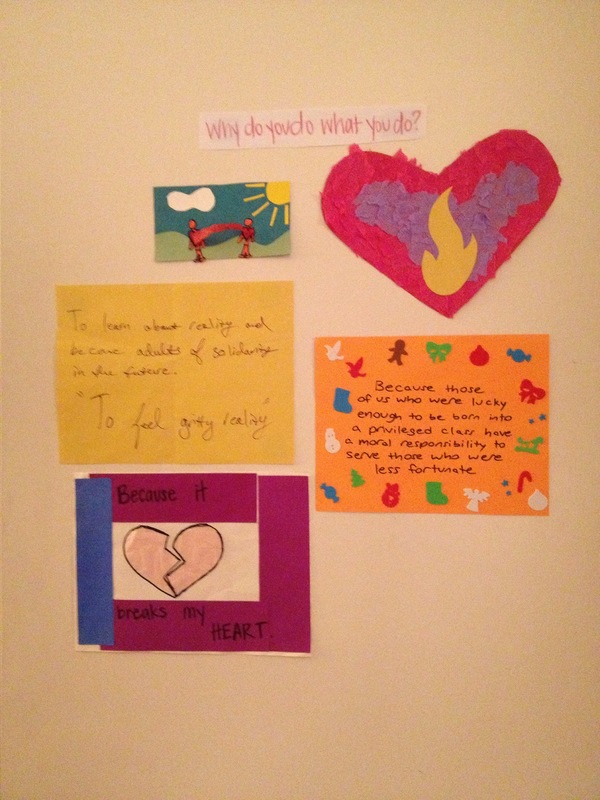 Ultimately, I planned a night around that question: Why do you do what you do? I told my community to consider the question; mostly because I didn’t want any quick-and-dirty answers. I wanted them to think about it. After setting them to work, I realized I would have to prepare other questions to keep discussion going. We talked about the broadness of the question, the ways in which we considered it, and after answering it, we talked about snapshot examples of our answers. Then, it was time to craft. I’m not good at crafting. I’m actually bad at it. I’m not creative, I don’t have that talent. Needless to say, I wasn’t too keen on the plan I had to make everyone use supplies to illustrate our answers. I wanted to skip ahead to the closing prayer I had found. But, I had no choice. I wanted a tangible collage to hang up so if any of us ever had a bad day, we could look at it and remember why we are here. So that’s what we did. And that’s what the picture above is. If you guessed correctly, great job! I have nothing to offer you as a reward, so pat yourself on the back. If not, oh well. I don’t blame you for not knowing. Why do I do what I do? Because it breaks my heart. There are several explanations for this answer. There’s a prayer that goes “break our hearts for what breaks yours” and it has always moved me. I am an empathetic person, so it’s not hard to break my heart. Seeing a person asking for change breaks my heart. That’s a good thing, however, because it means I care. It means I’m here and I’m motivated to act because of it. The other explanation is something my mom once wrote to me in a card. Just as a bone is stronger after it heals from a break, so our hearts can love in greater capacities after they break. In closing, we prayed through words written by Pierre Teilhard de Chardin, S.J. I’m currently in my seventh week of work at Sacred Heart. I realize that I need to stop keeping track of weeks like this because I probably sound like that parent with a 36-month-old child. First, an explanation for my WordPress silence: I don’t have Internet access at home so my time on a computer is spent at work. I haven’t had a sit-down by myself lunch break in a while, and those are the breaks I’ve been using to write bits and pieces of thoughts that will hopefully come together as this blog post. I’ve learned a lot of things. Kid groups are frequently better listeners than adult groups. Dorothy Day said a lot of really neat things. Always look a person in the eyes. Why are adults so bad at listening? I don’t know, but if I figure it out, I’ll tell you. One would assume the opposite when it comes to kids and adults. In my welcome tour experiences, it’s the kids who pay attention. There’s a possibility this is my fault; I think I need to be more engaging with adult groups. I’ll report back later. Points two and three go hand-in-hand. So many of us approach volunteering with a servanthood mindset, no matter how subtle. As I said, I’m guilty of this myself. We need to approach volunteering with a conscious knowledge that we are not, in fact, leaving behind our community to enter into a new one and serve. We are a community united to serve our brothers and sisters who do not have enough. We are not leaving behind communities to enter into different communities; we are all part of the same community. Dorothy Day, man. Dorothy Day. She was a can-do lady. I’m currently waiting on family to send me her autobiography The Long Loneliness and then I might be able to expand upon this point. Most of us see poverty in some form or another and most of us don’t recognize it or even ignore it. This is unacceptable. The thing is, once your eyes are opened to recognize poverty in its myriad forms, it becomes impossible to ignore. It becomes impossible not to be moved each time you drive by a person holding a cardboard sign on the side of the road or someone pushing a shopping cart holding all her belongings. That is, until you remind yourself of the work you do (or can do) for them. Go out, commit yourself to a local nonprofit that has committed itself to a marginalized population, and be not afraid. Most Jesuit Volunteers are working directly with marginalized populations, but not me. I work with the volunteers looking for direct service opportunities. My customer interaction is typically smiling and saying hello as I pass by in the hallways. I am here to inspire and engage volunteers. Maybe I’m not the one giving bags of food to customers, but I’m the one recruiting the volunteers who do that. Not every person will experience conviction of the heart when they volunteer, but if one person does, it’s worth it. I have done rotations on rotations, tours, tabling, orientations, and beyond. I worked in the food pantry, wandered the halls in search of volunteers who sneaked past me without a name tag, said a few goodbyes, complained about blatant ignorance, laughed, and made a lot of friends. As I said, it’s all worth it. My emotional roller coaster is out of control, but it’s so worth it. I can think of nothing more fulfilling that I could do than what I am doing now. For a long time I’ve searched for my niche in the world of social justice. My eight years of summer mission trips provided ample experience in the direct service realm, but I always thirsted for more. A foray into the realm of advocacy found that influencing policy makers was also not my thing. Slowly, over the past two years, I’ve come to realize that my niche is encouraging others to take a journey, like mine, into the world of social justice. Maybe my niche is to help others find their niches. By no means is this easy work. Sitting on this side of the volunteer desk has revealed many things about the inner workings of a nonprofit. Such as this: just because you, a volunteer, think you are being helpful by offering to come any time, doesn’t mean you actually are being helpful. In fact, you may be the opposite. I had a high-maintenance volunteer tell me that she wasn’t high-maintenance after an exchange of over 15 emails. I suppose that’s enough complaining on my part. But what does all of this come down to? Compassion, dignity and respect. There’s a difference between acknowledging the person asking you for money, whether or not you give anything, and keeping your head down and looking away. The latter is often the most comfortable, the easiest option. The first option requires us to look poverty in the eyes and see the person for who he/she is: a human being who deserves compassion, dignity and respect. All you have to do is give that person the treatment he/she deserves by way of his/her humanity. It’s not up to you to judge or feel pity. You should feel moved with compassion to act respectfully on behalf of that person’s dignity. Last week, a woman pulled me aside at Sacred Heart to talk to me. From what I could understand, there was a person who was bothering her every time she came for services. She told me that Sacred Heart is supposed to be a safe place, a positive environment and this person was ruining that. When I asked her what I could do, she reiterated the same points. When she stopped talking, she hugged me and walked away. Months ago, I would have walked away from that hug thinking about a shower and clean clothes. Months ago I might not have entered into that conversation. Last week I walked away from that hug with great joy, plus a little shock, hoping I had restored that woman’s faith in Sacred Heart as a positive environment. There are approximately one bazillion thoughts running through my brain and there’s no way to organize all of them right now. Yes, I have been here over a month, but there’s so much to process. I hope this post sheds some light on what I’m doing, all that I’m learning, and maybe some of the emotional roller coaster I’ve experienced. It had to happen. That blog title was just screaming at me to be used. Except that I’m already in San Jose and don’t need to know the way any more. I’m writing this up on my phone, so it won’t be anything groundbreaking or organized, just a quick update. I am a Jesuit Volunteer! I start my first day of work tomorrow. As one of my roommates put it, I can’t wait to feel like I belong somewhere. It’s strange not being back in St. Louis establishing a routine there. I’m in a new state, a new city and a new neighborhood. Strangely enough, it feels a bit like St. Louis when out walking and you see a boarded up house across the street from a gated community. Living in a four-year-old JV house means a perpetual game of stumbling across stuff I never expected to find. It’s quite exciting. We have an extensive VHS collection, with a few DVDs. The walls have wood paneling and there are plenty of fake cabinets and drawers that will mess me up for at least the next two months. Okay so she wasn’t talking about fake cabinets and drawers when she said that. She was talking about the four values of the Jesuit Volunteer Corps: spirituality, community, social justice and simple living. If that last paragraph wasn’t enough to convince you, I suppose I’ll just have to ask for your prayers. There are 60 of us JVs here in California and the work we are doing won’t be as easy as we probably made it seem when we described it to you. So send us some positive vibes and tell God we need Him. Last week I drank more cups of coffee per day than I have all summer. Coffee coursed through my veins and I still managed to nod off during a reconciliation service on Wednesday evening. Someone should have hooked me up to a coffee IV. Why did I need so much coffee? Because I went on a mission trip to New Philadelphia, OH called Gospel Road. It was my second year as an official chaperone. I spent last summer with six middle schoolers scraping and painting a house. This summer I had ninth and tenth graders and teamed up with Randi, a fellow neophyte in the chaperone business. The past few years I’ve spent a lot of time with high school students for reasons I haven’t yet entirely discerned. They are dramatic and self-obsessed, they blow things out of proportion, don’t follow directions, and put each other down. They don’t appreciate Bruce Springsteen, hate on boy bands that aren’t One Direction or the Jonas Brothers, and make me feel older than I am. My point is that teenagers can be the worst. Here’s where I’ll insert my disclaimer: I was once a teenager. I’m pretty sure someone at some point had the same thoughts about me as I have about current high schoolers. I give my sincerest apologies to those adults. Thankfully, teens really aren’t the worst. They tend to trust easily, love with their whole hearts, and speak their minds. Teens have some world experience, but not too much that they are jaded or overly skeptical. When it comes to working with teens, I live for the moments when things click. Last summer I spent two hours teaching high schoolers how to be attentive listeners. We did some exercises that opened their eyes to the small things that make listening easier. As a communication fiend, I was enjoying myself thoroughly; however, not everyone appreciates communication to the degree that I do. The next week I received a text message from one of the boys. He told me he loved the session so much that he took the exercises home and made his family do them. A few weeks ago, I led a session on prayer-writing. Last summer, only one pair really got the message I was trying to convey. This year, we ended our session in prayer and each dyad/triad read their prayers. I had goosebumps the whole time. Last week, I watched 13- and 14-year-olds interact with a 92-year-old veteran who told and retold his stories of growing up in a small town, traveling the world, and surviving Pearl Harbor. Just last night I managed to successfully wrangle two groups of 10 teens each into brainstorming ideas for youth group nights for the upcoming year. So why do I spend inordinate amounts of time with an age group that frustrates me so? Pope Benedict XVI once said that we were not made for comfort, but for greatness. He said that the world offers us comfort, but God calls us beyond that. Bishop Campbell of the Columbus Diocese said that you will know your vocation by the peace that it gives you. No, it’s not supposed to be easy, but it will bring peace. You could say that’s why I do what I do. I realize I’m speaking as if I’ve been doing ministry for 20 years — I haven’t — but I am a young person struggling to discern my vocation. Benedict’s and Campbell’s words help me make sense of my discernment. Perhaps I’ll do this for the rest of my life or perhaps God will call me elsewhere. When I try to conjecture beyond reason, God pulls me back and reminds me why He only provides a flashlight and not a floodlight. I definitely can’t handle a floodlight. As many of you may know, I am going to San Jose, California in August to serve with the Jesuit Volunteer Corps (JVC). Each domestic volunteer is asked to raise $600 and each international volunteer must raise $3,000. The money goes directly to JVC to support my fellow volunteers and me. JVC outlines more specifics about their revenue and expenses on the website, but they spend approximately $5,300 per volunteer each year and save the individual agencies about $20,000 a year. In essence, nonprofits such as the one I’ll be working for are able to take on another employee without spending more money. But JVC can only do so much; without the help of donors, JVC wouldn’t be able to cover the expenses of each volunteer. I was intimidated to begin fundraising for many reasons. Asking people for money isn’t easy. Six hundred dollars feels a little overwhelming. How could I do it? I’m pretty sure the last time I tried to raise money was by selling Girl Scout Cookies, and I was kind of really bad at that. Fortunately, I am blessed to have generous family and friends willing to donate what they can to support JVC and my journey. What I didn’t expect was such a large outpouring of support. Fellow graduates of the class of 2013, college students, peers, friends from far and near, family friends, and even anonymous persons have volunteered to sponsor me. Words do not properly express how thankful I am. This truly has been a lesson in gratitude. Knowing how many people support the journey I am undertaking inspires me to work even harder. I am humbled and grateful beyond belief. Here comes the part where I ask you for more money: I’ve passed the halfway mark, but I still need to raise $210 more! There is an African proverb that says if you want to go fast, go alone and if you want to go far, go together. I want to go far, but I can’t do it alone. I need your help. Join me in my journey to serve in San Jose and donate here. Most of all, I need your prayers. Pray for me, for my fellow volunteers, for my colleagues, and for the people we serve. I never expected to find a home in you, but I did. Four years of time spent here — peppered with visits to Ohio — made me fall in love with you. All your quirks and eccentricities that bother me so much and all the most wonderful things about you are what stole my heart. It was the sunrises after the all-nighters, the nights with all the windows open, the sunsets on the parking garage, the middle-of-the-nights in the library, and the afternoons in Forest Park. You rain monsoon-worthy amounts of water, turning walkways into rivers. You wouldn’t start snowing until I was halfway to class and without the proper boots or head covering. You gave us balcony weather in February and then froze the following week. When I first arrived, your chaotic weather tendencies drove me up a wall; one day a tornado and the next, a snowstorm. But I’ve grown to appreciate your outrageous humidity and less-than-temperate spring days. I love you, St. Louis. I am convinced that had someone magically transplanted my college experience to another town — Chicago, Cleveland, Baltimore, D.C., Dayton, Cincinnati, New York City — it just would not have been as wonderful. St. Louis, you are the cherry on top of the cake. I don’t like cherries so I guess that metaphor doesn’t quite hold up, but regardless, you know what I mean. Let’s try that again: St. Louis, you are the heaping pile of my Grandma’s homemade whipped cream on top of the ice cream scoops that are college. Sure, ice cream is nice, but whipped cream just makes everything better. Time and again, I return to the idea of holy ground. This idea that the place I arrived at four years ago has now become my home, and today I must leave it. The place in which I made the majority of my memories over the past four years is holy ground. Except college has become something that happened, in the past tense. The people I have come to know and love go their separate ways; some will return to you in the fall, others to their hometowns, and still others are scattered to the far corners of the country and the globe. While the people I love made you wonderful, St. Louis, you stand on your own legs with claims to some of the most amazing sites in the country. The Cathedral Basilica of St. Louis, for example, is one of the most beautiful churches in the United States. When I visited, I felt as if I were suddenly transported back to Italy and staring at mosaics crafted hundreds of years ago. It’s impossible to talk about you without mentioning your Gateway Arch. Rife with history, I managed to avoid visiting the top until just over a month ago. Amazing views paired with amazing stories make for a great adventure. If I never visit again, I will certainly lament not seeing Saint Louis University’s campus, but the greatest loss will be never lying in Forest Park on a sunny day again. From the Central West End, to the Delmar Loop, to the Science Center, to Laclede’s Landing, to Wash Ave, and to Humphrey’s, you harbor the best hangout spots. You are my home away from home and you will forever have a piece of my heart.